Here is video of some remarks that President Barack Obama made on Monday following his meeting at the White House about improving transportation infrastructure. As we posted yesterday, Los Angeles Mayor and Metro Director Antonio Villaraigosa attended the meeting to discuss the 30/10 Initiative, Metro’s plan to build a dozen Measure R transit projects in 10 years — not 30 — by using federal loans and other financing to be repaid by Measure R revenues. Among those projects are the Westside Subway Extension, the Eastside Gold Line phase 2 and the Crenshaw Line — to name just three. One of the pitches that Villaraigosa is making is that 30/10 isn’t just a program for L.A. — it could potentially be used by any region that has transportation taxes to borrow against. There is more info about the meeting, along with links to some recent reports at the White House blog. The White House is also using this new Treasury Department report to make the case for the need for more infrastructure investment; the report echoes many of Obama’s statements. Among the statistics is that the U.S. invests about two percent of its gross domestic product in infrastructure compared to nine percent in China or a five percent average across Europe. 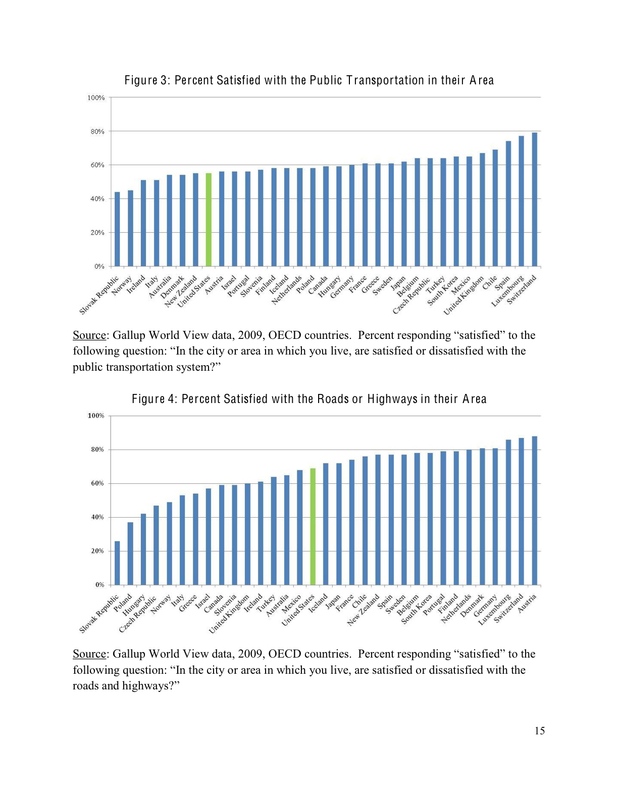 The report also has this interesting graphic below on where America stands in terms of its satisfaction with public transportation and roads. I’m not really sure what to make of it, but it’s clear from his remarks and the report that Obama is trying to build a message on transportation across several fronts — we’re falling behind other countries, Americans need more options to help them save money and building infrastructure is a good way to create jobs. We’ll see next year whether Congress agrees when they’re scheduled to finally begin drafting a new multi-year transportation spending bill.